Photo provided by Jonas Kremer. 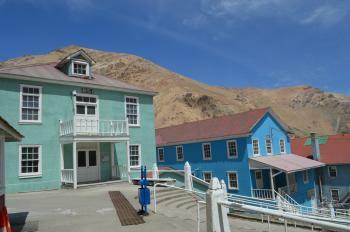 Sewell Mining Town is an example of an early 20th century mining town set up by a foreign company for copper mining. It is located in a harsh environment in central Chile on the slopes of the Andes, at an altitude between 2,000 and 2,250 metres. The camp was founded in 1904 by the Braden Copper Company to extract the copper in the mine, and, in 1915, it was named after the company's first president, Mr. Barton Sewell. In 1918, it already housed 14,000 people. Following many years of active life and achieving the construction and exploitation of the largest underground mine in the world, in 1977 the company started moving families to the valley and soon after the camp was being dismantled. The remains of the mining town consist of industrial, residential and social buildings. There are less information of how to get there, so I'm sharing the one I did and hope it helps anyone who intend to go. First, there's no direct bus from Santiago and you're permitted to get in on your one car. The easiest way is to book a tour with Fundación Sewell online (fundacionsewell@gmail.com). This is a non profit organization that's related to Sewell and it's way cheaper than those tours offered online. But then you have to know that you have to go to the meeting point. Here's what I did. Take a bus from Santiago and specified that you have to drop at Terminal O'Higgins Rancagua (cos there are TWO terminals). Then walk from the terminal to the meeting point at their office, it's about 10-15 mins walk if you googled the route. After the safety video we departed with tourist bus around 10am. The journey takes around 1 hour. I was lucky to have a good English speaking guide Anitza. Though she explained most of the time in Spanish to the Chilenos but she would explain to me in English for things that I don't understand. We started at the El Teniente Club with a video regarding history of Sewell, then the guide explained a bit of the surrounding and itinerary. We went to see the living quarters of the miners. At lunch time you can have the pre booked lunch or your can bring your own and have it at the miners restaurant. I was lucky to meet some miners and took photo with them at the restaurant when they came for lunch. After lunch we visited the first bowling alley in Chile where the miners used to have competition everyday and also you can ask you guide for the spooky ghost story about this place. Then we went to the little church and finally the museum. I strongly recommend the museum. It housed one of the most complete copper related items in the world. The ground floor has some minerals found close to the copper mine and a gift shop. The first floor is more to the tools used in copper mining and also some daily life of Sewell mining town in the past. Then the second floor has a vast collection of copper made items and artifacts from around the world. It will change your mind of how people from around the world use copper from past to present. And finally after the museum, we were lucky to have one hour to play with the snow. It's recommend to come during winter as it's covered with snow everywhere. You can throw a snowball or built a snowman. It was really fun. But make sure you bring waterproof shoes and windproof jacket as it tend to be cold outdoor. In October 2017, I made a long day trip from Santiago to Sewell Mining Town. Weekend trips organized by VTS (http://www.vts.cl) depart at 8:30 am from the international coffee chain just outside Baquedano metro station, one of the major transfer stations, and return to the same location around 7:30 pm, nearly 11 hours later. If you take the trip on a Sunday, as I did, bear in mind that the tour does not stop for lunch (included) until after the visit, around 4:30pm, and that most local stores in Santiago don't open on Sundays until after the departure time, so you won't be able to purchase breakfast or snacks until the first stop, more than an hour after departure, outside a supermarket in Rancagua, where other visitors join the tour. It's not easy to get here but it's definitely worth it. I organised a tour from Rancagua which went to the town once a week. There are also apparently tours you can do from Santiago. It's an incredible place to be in, with everything abandoned. There’s an old theatre that is empty but for the memories of the nights that the workers would spend here to find relief from the loneliness of their lives. Dormitory buildings have corridors of doors that are never opened or closed and hide an emptiness behind them. The wide and steep staircases between the buildings lead to nowhere. We went to Sewell in 2006 and it was quite interesting the buildings were very old and you could almost sense the people that used to live there, were still around it was very eerie bit we went into the actual mine and it was amazing especially seeing the giant crystal quartz.Amazing! We wemt on a tour with a tour guide and he was very informative and answered every question we asked him.It was exciting getting dressed up as a miner.Afterwards we managed to have lunch with all the other miners in the dining room.It is also a nice drive there and back.Lovely.I would highly reccommend this tour to anyone that has an interest in historical towns and sites and also anyone that has a desire to see how a mining actually works and operates. We visited Sewell in February 2008 encountering some difficulties. 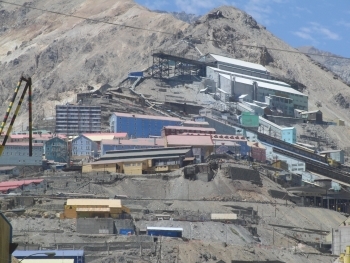 There is a homepage (www.sewell.cl) for sewell by CODELCO, the state owned company, which runs several mines, amongs them El Teniente, to which the mining town of Sewell belongs. This page is of limited use as rather than telling you how to get there, what it costs, etc, it refers to a company called VLT which has the monopoply of taking people there. This is done either by bus on Fro, Sat and Sun for approx 45 USD pP or on all other days as private tour for 144 USD pP. The committment that CODELCO seems to have with UNESCO is that Sewell as a seperate entity from the mine has to become profitable entity from its tourism engagements within a rather short timeline, otherwise CODELCO might step out. We have been told, that the number of tourist to come to Sewell for the reasons UNESCO declared it a world heritage is already declining after an initial peak, people are more interested in the actual mine rather than in an aboandoned mining town. Finally one has to understand that you see today only a fragment of the initial mining town, large parts, in particular the part where the american settlements were has been pulled down when the town had to be abandoned due to pollution problems. The restauration efforts which happened so far are rather disappointing, if they continue at that speed, the whole thing is gone within a few years. I have to stress however, that despite all the issues above it is absolutely worth seing and we had a very good and comprehensive tour which we much apprecheated. Visit it as long as it exits. 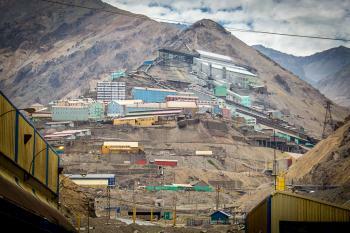 UNESCO should be much more rigid with states aor companies like CODELCO and ask for a deeper comittments and sould pu the place on the endangered list immediately. Built or owned by Americans: Developed by the Braden Copper Company which was founded in 1904 by Barton Sewell and William Bradon. " Barton Sewell never visited Chile and was limited to participating in the business as an upper executive at the companies central offices in New York". By 1916, 95 percent of the Company's stock was in the hands of the Kennecott Corporation owned by the Guggenheim brothers.